The last camper had left. The cabins had been swept clean of the dirt from the tramping feet of a hundred teenagers. The dining hall had been swept and scrubbed free from the grease of a summer’s worth of meals. The canoes had been pulled in from the lake and stowed in the boat house for winter. The fire pit had been emptied of ash. The gate on the road leading to Camp Riverwind had been locked. It started with a lone squirrel. Then another. Then a third, a fourth, and ten more leaped from the trees and skittered across the roofs of the cabins and dining hall. Finding no signs of humans, they moved to the ground, peered through the windows, and searched every nook and cranny before converging at the fire pit. “All clear!” the squirrel band chittered in unison. The signal carried throughout the valley to the ears of raccoons, beavers, birds, bobcats, a moose, and a black bear. The raccoons did not have to be told twice. They knew from years of experience that campers sometimes leave bits of food or, even better, shiny things to covet and fondle. The best treasures go to the quickest and cleverest raccoons. This year, the trash cans had been emptied, but not perfectly. The first raccoon found a few broken pieces of candy. The next found their shimmering wrappers. A third found craft beads in the dust beneath the picnic tables — one bead to slip on each claw, making her the most fashionable raccoon of the season. Having lost the race to the prime outdoor locations, the last two raccoons stationed themselves in front of the dining hall and waited for the beavers. The two beavers waddled out of the lake and got to work. The trick to the dining hall was to gnaw a small hole in the corner of one door, just large enough for a squirrel to squeeze through in order to open the door from the inside. Once in, a careful search of the kitchen revealed a large collection of keys. After the two raccoons in the dining hall finished arguing over who saw the colander first, they used their nimble hands to help unlock the rest of the camp. The scrub jays watched as the growing throng of critters raided the camp and declared victory over the previous inhabitants. But they were too busy making snide remarks to join in the celebration, cawing that they had been flying around camp all summer, and it was really no big deal. Besides, why celebrate the end of a camping season that had brought them so many seeds and other delectable scraps to enjoy? They did this every year. When the others converged on the fireless fire pit and started singing songs, the birds decided it wouldn’t hurt to watch the fools for a few minutes, other entertainment being scarce. And by the time the critters around the fire pit started singing, “Oh My Darling, Avian,” even the grumpiest of jays couldn’t resist joining in. Even the most superior bird must have some respect for the classics. Everyone gave the two bobcats their space when they entered. No matter how playful and sweet a bobcat seems, no squirrel will ever trust a creature with claws that sharp and an appetite that carnivorous. The bobcats took their space towards one end of the rough semi-circle of animals, singing for some songs, and merely tapping their claws during the others. The moose and bear were so late that they almost missed the entire opening jamboree. The larger creatures had learned, for their survival, to be somewhat more cautious around humans. Being big means being unable to scurry under a bush or up a tree at the sound of trouble. And humans could cause a lot of trouble. So they waited until dusk before making their way through the woods to the back of the gathering. Animal noises are well-known to humans, but, apart from the ostentatious warblings of songbirds, few of their songs have ever reached human ears. The magnificent bellow of a bull moose is nothing compared to his sweet, rhythmic baritone when he rumbles, “Old Moose River.” And, unlike chipmunk song, four-part squirrel harmony is always smooth and never squeaky. Raccoons are masterful crooners, but they have trouble agreeing with each other long enough to sing unison. The growly voices of bears and bobcats don’t suit every song. But for a song like “On Top of Old Smokey,” the punctuated roars are essential. Beavertail percussion completes the ensemble. The forest had never known sweeter songs. Darkness came, the singers tired, and one by one they adjourned to the cabins for sleep. The raccoons, squirrels, and beavers shared one cabin, sleepy piles of fur too tired to fuss or fight. The bear had her own cabin, due to her bulk. The bobcats had a separate cabin as well, due to their claws and tempers. The moose and jays were most comfortable outside. All slept soundly, dreaming of the adventures this week had in store. The campers rose bright and early to descend upon the dining hall. Two raccoons did most of the cooking, with some help from an assistant spice-squirrel. From the mix they found in the pantry, they cooked seedy pancakes for the birds and squirrels; bark-mulch pancakes for the moose and beavers; and fresh fish pancakes for the raccoons, bobcats, and bear. All had berries on top, but the bobcats insisted on smearing theirs around to make the pancakes look less like bread and more like meat. After breakfast, each animal picked an activity of his or her fancy. The birds were suckers for macramé, weaving long strands of colorful fibers into sturdy ropes and bracelets. The squirrels joined them at the craft tables, but preferred to thread beads to make tiny necklaces. Raccoons tried their hands at archery, as they did every year. In a rare feat of cooperation, two of them held the bow, two pulled the string, and one notched the arrow and aimed. The first five times, the bow knocked them down and tangled them up, but the sixth time: success! The arrow sailed through the air and almost hit the hay bale target. This was an all-time camp record. The raccoons chattered with impish glee, eager to boast of their victory to the other animals. But they almost lost themselves to squabbling when none could agree which one of them was most responsible for the perfect shot. Meanwhile, the beavers took a tour of the camp, analyzing the architecture from every angle. The cabins were built simply, using techniques the beavers had mastered long ago. The dining hall, on the other hand, was a never-ending source of inspiration: vaulted ceilings with exposed rafters, large windows with wooden shutters, a stone hearth in the center, and beautiful wood trim in every corner. The moose meandered along behind them, nodding his head from time to time. He understood very little of their shop talk, but enjoyed the company and pretended to follow along. Suddenly, a feline scream rang out from the nearby hills. The bear and a bevy of birds hurried to help. When they arrived at the source of the sounds, they found two bobcats high in the treetops, fluffed up to twice their normal sizes. Apparently, they had taken the zip-line and found it more thrilling than anticipated. The scrub jays danced along the innocuous cable, cawing and cackling at the predators’ misfortune. Eventually, the cats climbed down and spent the rest of the afternoon sulking over their hurt pride. The bear waited until they had left to take her turn. The next day brought more of the same. The raccoons tried to convince the moose they could shoot an arrow between his antlers. The bobcats played with macramé string while trying to look dignified. And the squirrels and bear played hide-and-seek. There aren’t many places for a bear to hide. Trees provide little cover when the seeker is a squirrel. Buildings with large windows provide no cover at all. But the boat house was large, dark, and filled with canoes. It was worth a shot. A minute passed and the bear had not been discovered. Then five minutes. Then ten. Twice, she heard the scratching of little paws racing by. Once, she was sure she heard the “it” squirrel open the door and peer inside, but he gave up before checking all the corners. It wasn’t until half an hour had passed that the bear was finally discovered. All the squirrels were impressed at her ingenuity. They hadn’t believed a bear would fit between all of the canoes. They counted ten — no, twelve — canoes in total. The animals had seen canoes on the lake every year, but never thought to float in them. The animals who liked to swim saw boats as unnecessary, and the animals who did not preferred to stay closer to the shore. But, the squirrels argued, practicality was hardly the point of camp. Archery and crafts were equally ridiculous, yet plenty of fun. After the squirrels made their case at the evening fire pit circle, a brief but noisy discussion ensued. Who would be the judge? How would they propel the canoes, lacking human arms to paddle? In the end, they agreed that participants would be allowed to use whatever strategies they could devise, and the bear and moose would serve as judges. The rest of the animals formed teams by their species. Only the bobcats declined to participate. The race would take place the following afternoon. Breakfast the next morning was brief. Each team was eager to start preparing for the competition. The squirrels were sure they would win, since they came up with the idea in the first place. Squirrel logic. The raccoons were confident in their wealth of shiny objects, which could surely buy victory. The scrub jays claimed not to care about the contest at all. Birds shouldn’t have to prove their obvious superiority to the flightless folks. But since the other animals needed a reminder, they would oblige. The beavers refrained from boasting almost entirely. They considered it unprofessional, and this contest was clearly a serious endeavor. Boats were, of course, merely a specialized kind of architecture. By early afternoon, the entire camp had gathered at the waterfront. Four canoes were resting halfway in the water with their respective teams around them, having been dragged there earlier by the moose and the bear. The moose reviewed the rules. The first team to move their canoe to the center of the lake, as marked by an old buoy, and then return it to shore would be the winners. The bear let out a starting roar, and the race was on. The first team to make progress was the squirrels. Half of the squirrels dragged a strange contraption of sticks and cloth into the canoe, while the rest pushed the canoe further into the water and climbed aboard. Once afloat, the contraption unfurled to reveal a bed sheet sail hanging from a tree branch mast. Bead necklaces secured the mast to a seat in the middle of the canoe. Crude though it was, the sail caught enough of the afternoon breeze to propel the squirrel team to an early lead. The squirrels cheered and congratulated themselves repeatedly on their cooperation and ingenuity. The jays were prepared as well. They used long ropes of macramé to harness themselves to their canoe so they could pull it like a team of flying horses. At least, that was the plan. In practice, the canoe was heavy, and the birds were small. So, upon reaching the end of the rope, each bird met with a sudden jolt from the mass of the canoe and plummeted downward. Catching themselves mid-fall, they rose up again, gave the canoe a second tug, and the process repeated itself. Bit by bit, the canoe inched forward as the birds performed their strange, lurching dance. The raccoons had brought no equipment, only currency: fourteen foil candy wrappers, thirty-six glass beads, and eight smooth, round stones that fit in a raccoon’s paw just so. Since bribing the judges would be unsportsmanlike, the raccoons decided to hire the bobcats to push them. Half of the treasure would be paid in advance, and the rest would be awarded after the raccoons took first place. 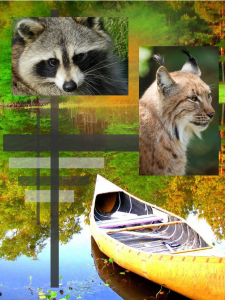 The bobcats, however, had no interest in raccoon trinkets and even less interest in approaching the water. Swimming was for fish, and fish were for eating. Not for emulating. The bobcats motioned to the dead fish they had brought for snacks. While the raccoons furiously defended the value of their goods and the worthiness of boat-pushing as a feline career option, their canoe sat motionless in the sand. The beaver canoe was also motionless, and the two beavers were nowhere in sight. After some time, they reappeared dragging a second canoe from the boat house. The bear and moose looked at each other, but nothing in the rules prohibited multiple canoes. After placing the second canoe next to the first, the beavers disappeared into the woods. When they returned, they brought a carefully measured log, which they positioned between the two canoes. The next step was to fetch discarded planks of wood from the firewood pile, which slowly came together to form a platform on top of the log and canoes. The traditional cement for beaver construction was mud and rocks, but this project called for something stronger and lighter: fitted wooden joints. By gnawing grooves in the boards, the beavers created a rough approximation of the techniques they had seen in the dining hall ceiling. Not far from the beaver construction zone, tensions between the five raccoons and two bobcats had gotten out of control. The raccoons had utterly failed to persuade the bobcats to help them. Since shiny objects and clever rhetoric had both failed, the raccoons resorted to theft and violence. Simultaneously. They grabbed the bobcats’ fish and began to swing them wildly, slapping the confused bobcats repeatedly. The bobcats were stunned. This was their first time being fish-slapped by a frustrated gang of raccoons. Once they overcame their amazement, they slashed the fish to pieces and chased the raccoons all around the camp. The canoe remained motionless. The harnessed team of birds continued to make slow but steady progress. To coordinate the rhythm of their tug-and-fall strategy, they began a squawking chant. To cope with the extremely strenuous task of hauling a large canoe through water, they worked out a rotation scheme for birds to sit on the boat and rest before returning to duty. The squirrel racing team was the first to reach the buoy in the center of the lake, well ahead of the birds. For the return trip, however, the wind was against them, and the squirrels had no experience sailing into the wind. They tried facing the other direction and thinking really hard about the shore, but to no avail. Running around the canoe also had little effect. In an increasingly frantic attempt to turn around, they began to spin and swing the mast wildly. Surely some angle would make their boat go the other way! Instead, the wild swinging made the canoe rock until it fell over, tossing the fifteen miniature sailors overboard. Squirrels are known neither for swimming nor for staying calm in an emergency. Each thrashed around desperately and ineffectually. The birds didn’t notice — they were lost in their chanting. The beavers, of course, were lost in their woodworking. And the bobcats and raccoons were busy chasing and being chased, respectively. The moose saw the scene unfold and knew what had to be done. He waded into the water, deeper and deeper, until his hooves no longer felt the gravelly lakebed. Then his powerful legs began to kick in long, strong, cyclic strokes to propel him through the water. He was unintentionally majestic. The drowning squirrels had just enough sense to climb on the shoulders and antlers of their savior when he arrived. It was a crowded ride back to the beach, but none of the squirrels complained. The black bear met them with sheets, curtains, and other stolen scraps of cloth that could serve as towels. In the end, the birds were the first and only team to finish the race. The awards ceremony was held on the floating platform that the beavers had built, where all of the animals fit comfortably, except for the moose who stood nearby. The bear awarded colorful ribbons to the scrub jays for placing first in the contest. Their victory caws were loud and long. When the caws died down, the squirrels stepped forward to present a special award of valor to the moose. The trophy was a wreath of tender branches taken from high in the trees and woven into a circlet. Finally, the raccoons presented themselves with a special award for Most Masterful Survival of an Encounter with Angry Bobcats. Their self-given prize was the very baubles they had originally offered to the bobcats as payment. The bobcats glared but said nothing. The beavers considered the sound construction and successful launch of their platform ship to be reward enough. When the ceremonies were over, the squirrels began to dance. Bushy tails waved and twirled as the squirrels jumped and spun. Several of them joined paws in a circle and marched around one way, then the other, then into the middle and back out again. Each step was punctuated by high-pitched chitters of glee. The raccoons were in a mood to celebrate, too. Two of them began to dance a foxtrot around the platform. Not to be outdone, another two started to tango. The fifth raccoon had no dance partner, but she had other skills. She picked up three smooth stones from the raccoon prize pile and juggled them. The bobcats soon found themselves covetously mesmerized by the movements of the very stones they’d spurned before. The scrub jays were still tired from their extreme exertion during the race, but not too tired to show off a little. They took to the sky in vee- and star-shaped formations, ascending and then descending into loops and barrel rolls. Without a canoe weighing them down, they felt lighter and freer than ever before. The beavers just sat back and enjoyed the show, proud of their handiwork that had made this floating party possible. The morning of the final day of camp was spent cleaning up from the previous days of mischief and fun. The beavers disassembled their canoe platform. The bear and moose returned the boats to the boat house. The jays re-hung the curtains in the cabins. The squirrels picked up every piece of litter they could find. The raccoons grabbed brooms and swept the buildings clean of mud, fur, and feathers. Even the bobcats helped out, in their way, by sleeping on each of the beds a final time to make sure they’d all been returned to their original, comfortable conditions. Finally, the raccoons locked the doors, returned the keys, and camp was closed once again. The animals met at the fire pit one last time, for the beginning of their annual parade. They had seen humans hold parades many times, marching along the forest trails almost every day of the summer. The animals didn’t know what made these trails more special than the rest of the forest where the humans didn’t walk, but clearly they were important. So, once a year, on the last day of camp, the animals held a parade of their own. The moose led the way, stately and regal as he ambled among the trees. The squirrels scurried close behind, trying to keep ahead of the others while playing tag at the same time. The raccoons walked awkwardly with their arms full of treasures. The scrub jays flitted about above the throng, laughing at the idea of walking so far. The beavers discussed trail maintenance and erosion prevention methods. The bobcats argued about whether or not rocks became alive when juggled, and what one should do about it. The bear brought up the rear, soaking up the cheerful, lively sounds of her companions’ conversation. When they reached a clearing at the top of the highest hill, they sang a final song: “Kum-bear-ya.” Then it was time to part ways, until next year. Previous Previous post: Furry Book Month! Next Next post: Furry Book Month — Week 2!